It proves that Turkey cannot change from within! Western forces could apply the same principles to Turkey as they did (albeit erroneously) to Saddam Hussein and Gaddafi. The evidence for intervention is mounting. 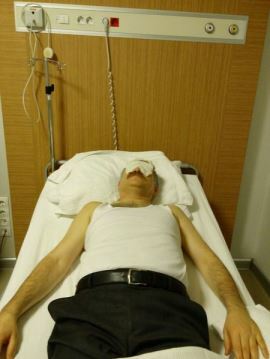 Tim Drayton wrote: Police intervened against the rally in Ankara using tear gas and opposition MP Levent Gök was taken to hospital after suffering the effects of tear gas. The Turkish Union of Bar Associations has applied to the Supreme Board of Judges and Prosecutors for a judicial and administrative inquiry into the judge (İsmail Yavuz) and prosecutor (İrfan Fidan) responsible for the decision to remand Can Dündar and Erdem Gül in custody. I wouldn’t hold out much hope though, as the Supreme Board of Judges and Prosecutors was brought under the direct control of the executive (now who would that be?) in a 2010 constitutional amendment, in blatant breach of the principle of the separation of powers generally considered to be essential for democracy to function. ...it makes sense, from an Islamist's point of view, always at War, what is natural. and where their plans include the world's subjugation. Actually, all totalitarian regimes stifle press freedom, not just Islamic ones. ...all totalitarian regimes, also consider Peace temporary. Yes. ...in the end, all totalitarian regimes fall, by feeding on themselves. "Freedom of speech" in the banana Republic. Lordo wrote: who exactly is erdogan sending these weapons to. is it isil or terggman of syria. or are the terggman of syria members of isil. 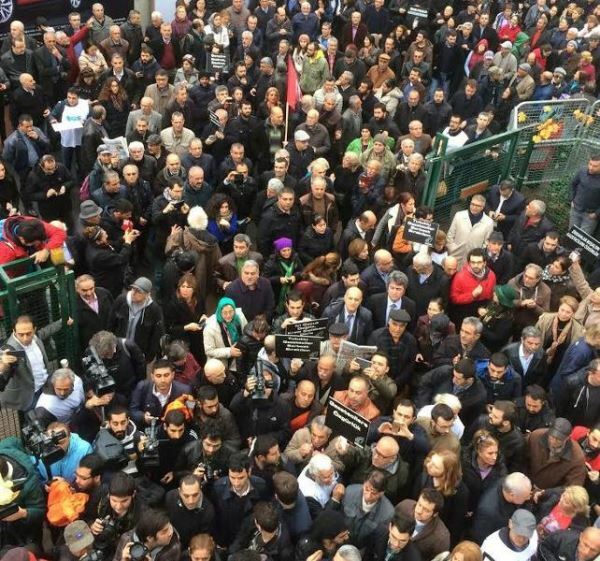 People shown gathering to go on a protest march due to start at noon today in support of press freedom and in opposition to the pre-trial detention of journalists Can Dündar and Erdem Gül through Istanbul to end at the Cumhuriyet newspaper office.